Cacciatore is a dish that I grew up with. My mom and my grandma used to make it all the time, but their version had chicken in it. I used all the same veggies and served it over whole wheat pasta. The tomatoes and wine in the cacciatore make a nice light sauce for the pasta. It would be great with vegan “chicken” cutlets, like Gardien, in it as well. 1 lb of whole wheat pasta cooked according to package directions. Heat 1 TBSP of the oil in a large skillet over medium heat. Add in the sliced mushrooms and sauté about 8 – 10 minutes until the mushrooms are browned. Remove the mushrooms and set aside. Add the remaining 2 TBSP of oil into the pan. Add in the peppers and onions and sauté about 5 minutes. Add in the garlic and cook another 2 minutes. Return the mushrooms to the pan. Pour the white wine into the pan and continue to cook another minute. Add the diced tomatoes into the pan along with their juices. Simmer the cacciatore about 8-10 minutes. Add in the chopped basil. 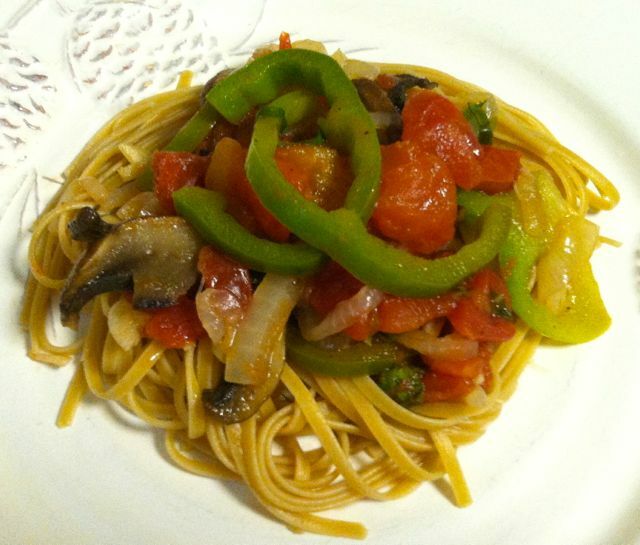 Serve the cacciatore over whole wheat pasta or with vegan “chicken” cutlets.